We developed AIR MATIC in corporation with ROBERTA by combining the OEM cup-shaped cylinder with the original air supply system designed by SKIPPER in the past. Now, SKIPPER introduce new “TRICK”, a complete system operated by a hydraulic power source. 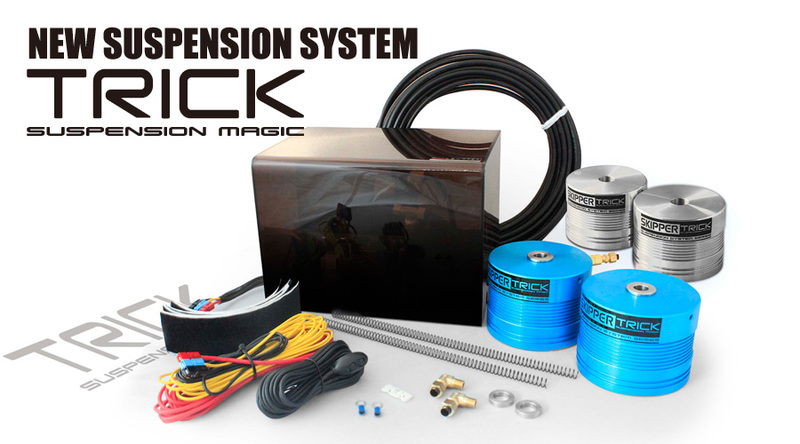 TRICK has been developed as a result of SKIPPER’s long history of cultivating know-hows of vehicle height adjustment for hydraulic suspensions, air suspensions, etc., and our especially abundant achievement and experience in hydraulic systems. Both AIR MATIC and TRICK (hydraulics) similarly use the ROBERTA cylinder cup because of its high reliability, although the internal structure of the cylinder is different between two products. SKIPPER proudly presents you these two suspension systems. TRICK hydraulics cylinder is installed under the spherical ball bearing upper mount for adjusting vehicle height. With TRICK, you can lift up your car from inside of the vehicle. TRICK is very easy to operate. Once you push a lift-up button, lift-up operation automatically starts until the maximum height is reached. You do not need to keep pushing the button during the lift-up operation. Similarly, in lift-down operation (to return to the original vehicle height), you can also complete the operation only by pushing the button once. is filled with oil fed from the pump unit, and the vehicle height is up. This cylinder lifts up/down the vehicle height. Designed completely originally, the cylinder can lift up/down the vehicle smoothly without fail. The cylinder is beautifully finished with blue alumite or silver alumite, compact, and light-weighted. In AIR MATIC, the cylinder is fixed with a wire stay, when mounted on the strut-type suspension, to prevent rotation of the cylinder which occurs while you operate the steering wheel or the shock absorber operates. Besides the wire fixing, TRICK uses a thrust bearing in the cylinder. A power source unit is needed for installation of the system that enables vehicle height adjustment with the switch. All suspension system series from SKIPPER have been highly evaluated in its compactness. TRICK is also made as compact as possible. At the same time, you will also be impressed visually with a special casing. ATF fluid oil is used. In the case of air suspension, a strong compressor is needed to forcibly refill a certain amount of air. This causes a large operation sound that may be loud enough for some people. However, a hydraulic pump unit in TRICK is very quiet and does not generate noisy sound even when mounted in the trunk room. Our controller attached to TRICK uses an organic EL monitor that allows operation monitoring. At the start-up, the SKIPPER logo appears on the monitor. After that, an indicator will be displayed to allow you to monitor the operation of the system. You can lift up or lift down (return to the original position) from a remote place. Remote control operation is only available manually. Automatic operation is not available. The liquid crystal display monitor of the remote controller does not show the operation state. TRICK suspension requires coil over suspension system. We can make a wide variety of TRICK cylinders in conformance with many kinds of vehicles and coil over suspension manufacturers. * To modify the cylinders, please fill in a custom order sheet or send your original suspension assembly to us. 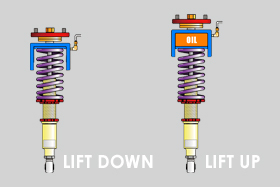 Although the cylinder travel is about 50 mm, a lift-up distance differs according to vehicles, such as the shape of the spring, a lever ratio, and so on. The coil over suspension needs space for installing TRICK cylinder. The vehicle height is raised by the thickness (about 30 mm) of the cylinder. Please adjust lower spring sheet to return to a desired height. TRICK suspension basically requires the spherical ball bearing upper mount. If your coil over suspension does not have the spherical ball bearing upper mount, we can make it as one-off production. Please feel free to ask us. Additional fee is charged for one-off production. AFT fluid oil is used. Copyright © 2014 SKIPPER All rights reserved.